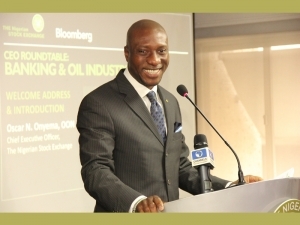 The Nigerian Stock Exchange (NSE) in collaboration with Bloomberg organized CEOs Roundtable on Thursday, July 25, 2015. The maiden event which focused on two systemically important sectors, Banking and Oil & Gas, brought together African captains of industry and key influencers to share in-depth knowledge about their sectors with key players in the capital market. In his welcome remarks, Oscar N. Onyema, OON, Chief Executive Officer, NSE, noted that the event is in line with the commitment of The NSE to develop key sectors of the nation’s economy. “It is a high level focused interaction, conceptualized to discuss topical issues impacting different sectors of the Nigerian economy. We believe that through a forum like this, we can critically look at global developments and their impact on our businesses, cross fertilize ideas on how to take advantage of these developments or mitigate the risks they present to our market. Ultimately, this forum will guide thought leadership on major global developments”. 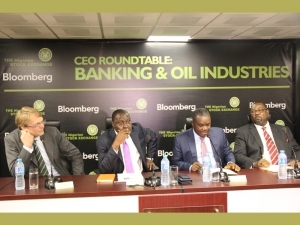 The CEOs Roundtable featured two panel sessions that brought together the perspectives of the various panelists into a cohesive conversation of salient issues and innovative ideas in the banking and oil & gas sectors in the Nigerian economy. The first session which focused on The Nigerian Banking Environment in a Low Oil Price World, had the Group Managing Director/CEO, First Bank of Nigeria Limited, Mr. Bisi Onasanya, Group Managing Director/CEO, Zenith Bank Plc, Mr. Peter Amangbo and the Executive Director, Treasury and International Business, United Bank for Africa, Mr. Femi Olalokun, as panel discussants and Mr. Paul Wallace, Emerging Markets Analyst, Bloomberg L.P, as the moderator. The panelists stressed the need for further adjustment in the Naira given the current situation and emphasized the need to diversify the economy, broaden the base of income and restore liquidity in the foreign-exchange market. The second panel session focused on The New OPEC Strategy: Implications for African member nations. This session was moderated by Ms. Yinka Ibukun, Bloomberg News Analyst, Nigeria, and had Mr. Philipp Chladek, Senior Oil Industry Analyst, Bloomberg Intelligence, Chairman and MD, Mobil Oil Nigeria Plc, Mr. Adetunji Oyebanji, CE​O, Seplat, Mr. Austin Avuru and MD/CEO Oando Gas & Power, Mr. Mobolaji Osunsanya as panel discussants. They stressed the need to deregulate the downstream sector of the industry which will result in efficiency, more investment and reduced smuggling in the sector. 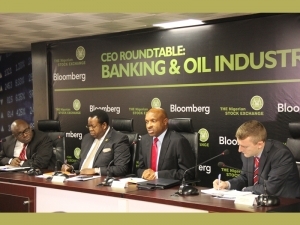 The maiden edition of the ​NSE/Bloomberg CEOs Roundtable provided a unique platform for participants to engage with industry experts on key burning issues in the Banking and Oil & Gas sectors.